Rec: August 2000, St. Paul�s School, Hammersmith, England. 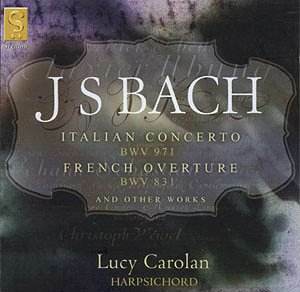 Lucy Carolan continues her exploration of Bach�s keyboard works with a selection of works that has often been recorded together. From the sprightly Italian Concerto to the stately French Overture, this disc includes an interesting overview of the variety of styles that Bach composed. Carolan starts out well, giving the Italian Concerto the energy and creativity it deserves. She takes the andante and makes its delicately-sculpted melody sing out in a smooth, round fashion. But her harpsichord has a tinny sound in the upper registers, and this movement makes ample use of the higher notes; this sound detracts from her performance, which is more than satisfying. But the volume of this recording is very low, and the recording itself is poor - there is little brilliance in the treble end of the instrument, and I had to increase the treble on my stereo to listen to it, something I almost never do. This heavy sound spreads across the entire range of the instrument, making some passages sound muddy and confused. The double-manual harpsichord she plays here doesn�t have the beauty of the two instruments she used on her previous recording of the partitas, and the crisp, brilliant sound of that recording is missing here. It is hard to recommend this disc - there are so many versions of these works that are better, both in performance and recorded sound. Listening to Scott Ross play the opening of the French Overture, one can hear a true French sound, with the most intense energy and focus, his extroverted flourishes bringing this performance to a rare level of hubris. Or who can forget the brilliant performance of this same movement by Glenn Gould - if I had to select only one movement recorded by Gould to take on a desert island it would be this one. Even Angela Hewitt, more restrained, lets loose in this movement, stretching it out to more than 12 minutes of inspired playing. Perhaps that�s the difference with Carolan�s recording - she doesn�t sound inspired. Where is that "verve and vitality" that I heard in her recording of the partitas, released last year by Signum? It seems that, at times, Carolan might be mistaking here speed for inspiration. Gould�s performance of this movement is much slower - it take 50% longer - yet it is full of emotion. Carolan sounds like she just wants to play the music, not breathe it. Lucy Carolan is a promising harpsichordist. Her recording of the partitas was excellent, and I had hoped for more from this disc. Alas, it disappoints, but because of the performance and the recording.